MTG control decks have an Eternal-God win condition. Every color in Magic: The Gathering will have a God-Eternal in the War of the Spark expansion. Set to release at the end of April, the expansion will contain a full 36 planeswalkers, legendary creatures, spells, and Armonkhet God-Eternals brought back in zombie form. The most recent to join Nicol Bolas’ party in white is God-Eternal Oketra. Prior to becoming a zombie God-Eternal, Oketra was the god of order, stability, and protection. In War of the Spark, however, God-Eternal Oketra is a five mana (double white) legendary zombie with double-strike. Not as powerful as Zeltalpa, Primal Dawn (Ravnica), her attack is three with a defense of six. God-Eternal Oketra isn’t going to make it into decks because of double-strike and her power/defense. She will, however, get played often due to her static ability. “Whenever you cast a creature spell, create a four/four black zombie warrior token with vigilance,” the card reads. And like the other gods fighting alongside Bolas, she can’t be permanently removed from play. 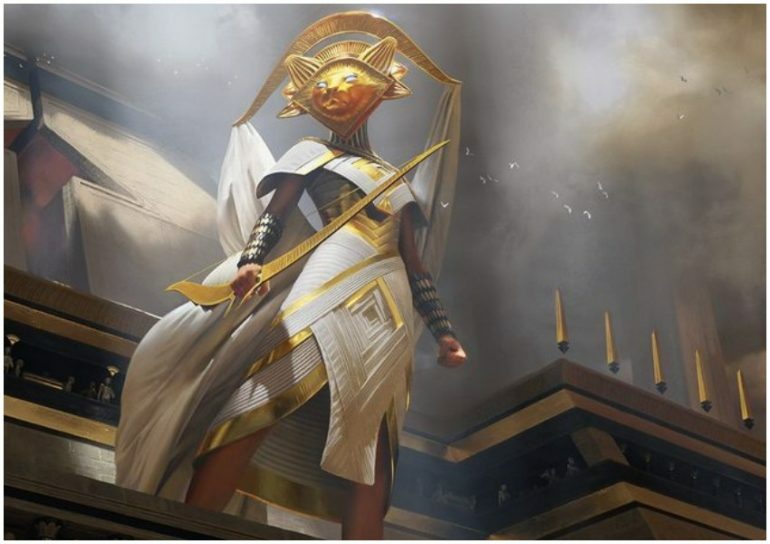 “When God-Eternal Oketra dies or is put into exile from the battlefield, you may put it into its owner’s library third from the top,” the card reads. Esper and Commander decks will like Oketra, yet the amount of Standard play she’ll receive is undetermined. At four mana, she’d be in like Flynn. But don’t count Oketra out in limited. 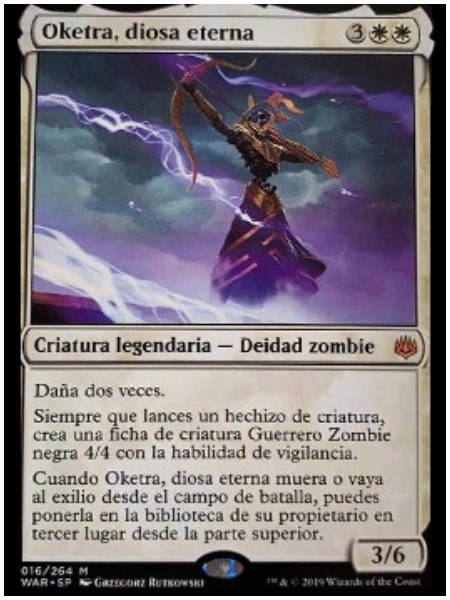 Also, if her tokens were zombie army (able to synthesize with Amass), God-Eternal Oketra would have stolen the show. Instead, they’re powerful chump blockers who, when stacked deep enough, can provide adequate damage to an opponent. The War of the Spark expansion will become available on April 27 in MTG Arena and on May 3 in paper form.